Let's start with the color scheme, a crucial element when developing a logo and/or brand. Generally a logo will consist of 1-3 colors, and for the most part, black/white/grey are neutrals that automatically are included in your color scheme. Atlanta United FC decided to go with black combined with a rich red and two-tone gold, a highly strong and visually appealing color palette. Using the gold in the foreground, and the red-and-black-striped background, the contrast causes the anchored A to really stand out. 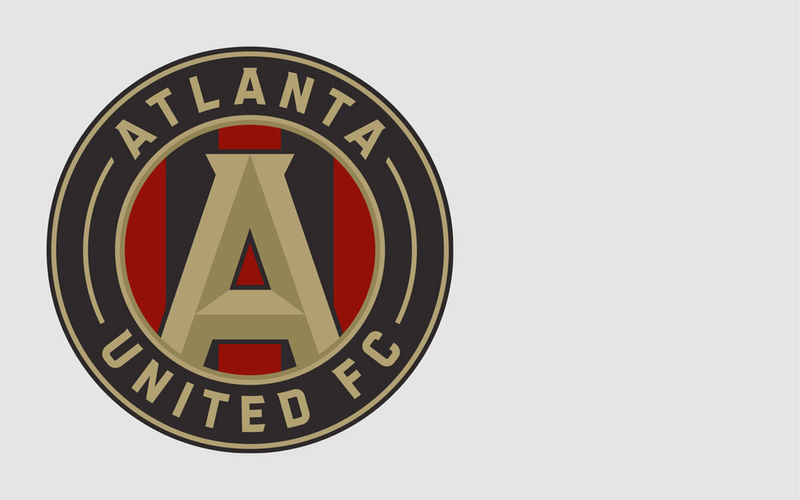 Obviously the A represents ATLANTA, the circle represents UNITED and of course FC for FOOTBALL CLUB, don't think that needs mentioning, but just in case. One thing people might not notice is, by anchoring the A to the inside of the logo, we get the correlation of unity and commitment, a clever and distinctive touch. We see this happening in the most recent years with new logos and company re-brands, simplify, but every corner of the logo has meaning to it. Remember Columbus Crew SC's re-brand back in 2014? Pretty much the same thing, simple shapes but they each hold meaning. Though unlike ATL(being an expansion team, they were able to start with a clean slate), Columbus Crew SC re-branded from an already established brand. Columbus had evolved into a more business white collar city, and no longer the blue collar city the three workers represented on the original shield. This was something the new owner, Anthony Precourt, wanted to fix right away. However, a great logo or brand doesn't just work as a simple logo on a white background. How do these colors translate to the uniform? Well, I'd have to say they look pretty damn good. Mirroring the logo, the home jersey features bold black and red stripes, as well as the shoulders. The traditional three stripes Adidas uses on the shoulders is a nice way to break up the front and back. The gold sponsor logo is a satisfying touch to keep the whole kit in brand colors. Of course, the logo – bold and shiny – on the left chest is a great way to hide the fact it's still just a circle. And, having the MLS logo on the sleeve in Atlanta United FC colors really brings the uniform together. I have been a fútbol/football/soccer fan since the day I was born, but never really followed the MLS. Growing up in Illinois I occasionally rooted for the Chicago Fire, especially when Jorge Campos and Cuauhtémoc Blanco had their stints. I just haven't been much of a MLS fan. This year, I decided I needed to start following soccer domestically, and being a designer, what better way to make that decision than deciding on logo and brand. Besides the club's awesome color scheme, I really like what Atlanta United is doing in terms of its signings and overall foundation – not to mention the new Mercedes-Benz Stadium that should be finishing up this season. What I would have liked to have seen is the circle be made more into a shape. Since Atlanta was a railroad town, and the players hit a stake in at the end of the game in a track, why not have the circle be the shape of the top of railroad stake? It's simple and has meaning behind it. Not to mention, it would help differentiate them from the other teams that use a circle for a logo, such as New York City FC, Columbus Crew SC or the Philadelphia Union. Sort of like the Chicago Fire's logo, it's a circle but in the shape of a fire department badge. Overall, I'm still very satisfied with Atlanta United FC's logo, there could be some minor adjustments made but yet it's a strong logo for me. Make sure you follow me on twitter for new posts! @designbyalva or click the link at the bottom! Next I'll be reviewing Fresno Football Club, newly added franchise for the 2018 season with the USL. Be on a lookout for it! Originality- What makes the logo its own? Does it stand out among the rest, or blend in? I like to think that there was some extra work making it one of its own. Creativity- Is there that special thing that makes it stand out? What sets it apart from the others in a special way? I want to see something that hasn't been done before, or some type of special modification. In this case, the integration of the A into the circle shied is what I find intriguing.